I’m goin’ there to see my Mother. So, I’m just goin’ over Jordan. 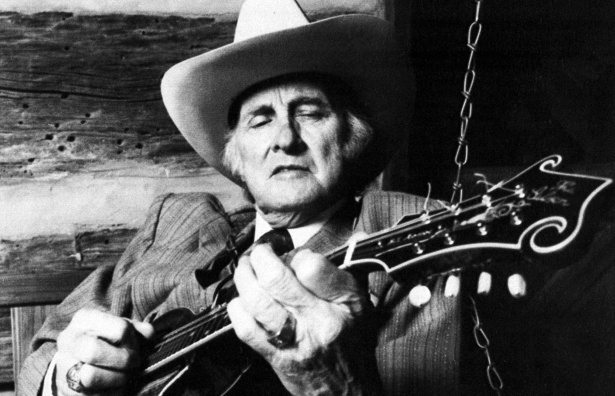 Born on a farm near Rosine, Kentucky, in 1911, Bill Monroe learned to play guitar and mandolin as a child, absorbing musical influences from both the white and black traditions of Appalachia. By age 12, he was performing at country dances with his uncle, Pendleton Vandiver (later immortalized as “Uncle Pen” in one of Monroe’s best-known songs). By 1932, Monroe and his two brothers were working as square dancers for a Midwestern rival of Nashville’s Grand Ole Opry. The Monroe brothers launched a radio show in 1934 and steadily built a following throughout the Midwest and South. Monroe went on to form the first incarnation of his Blue Grass Boys in 1938 and was hired as a regular performer on the Grand Ole Opry. The first recordings of Bill Monroe and His Blue Grass Boys were made in 1940 for the Bluebird label. Monroe is generally credited with inventing Blue Grass, a highly influential and sophisticated approach to traditional Appalachian folk music. This entry was posted on September 27, 2015 by Vox Populi in Music, Opinion Leaders, Poetry and tagged American folk songs, Bill Monroe, Bluegrass, The Wayfaring Stranger.